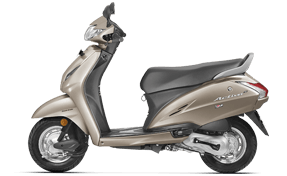 Updating its 2017 line-up, Honda Motorcycle & Scooter India (HMSI) today launched the fourth - generation model of its top-selling 110 cc scooter - Honda Activa. Priced at Rs 50,730 (Ex-showroom, Delhi) the new-gen Honda Activa 4G now comes with a BS-IV compliant engine and Automatic Headlamp On (AHO) function. This is HMSI's second launch in India this year after the new-gen Honda Activa 125, which was introduced last month. The Activa 4G also comes in two new options - Matt Selene Silver Metallic and Matte Axis Grey Metallic in addition to the existing colours. Honda Activa 4G continues to be powered by the same 109 cc Honda Eco Technology (HET) engine, but as mentioned earlier, it is now BS-IV compliant. The motor is capable of churning out 8 bhp at 7500 rpm and develop a peak torque of 9 Nm at 5500 rpm while mated to an automatic CVT gearbox. In terms of styling, the new Honda Activa 4G is reminiscent of its predecessor. The design language of the Activa 4G is simple and one can also say that it has been the design template for most scooters on sale in India. The neutral lines of the scooter are a deliberate effort by Honda designers to make the scooter appeal to the masses. The scooter features handlebar-mounted headlamp with the turn indicators integrated into it. The slightly raked front apron is simple looking, with faux air vents. The rear section sports an attractive tail lamp that does gel nicely with the rear unit and one can see the ‘4G’ badge on the rear body panel. The 110cc scooter carries forward the same analogue unit as its predecessor, consisting of speedometer, odometer, fuel gauge and tell-tale lights. The new Honda Activa 4G finally gets a mobile charger as an extra option. The bike is certainly a performer, the ride and handling is also great and despite new changes, the bike looks as stylish as its competitors. Powering the Honda Activa 4G is an air-cooled, 110cc, single-cylinder engine which is now BS-IV- compliant. The motor develops 8PS of power and 9Nm of torque. Honda claims a mileage figure of 60kmpl and a top speed of 83kmph for its highest selling scooter globally. The scooter employs an underbone chassis which is suspended on trailing link suspension at the front while a monoshock unit does duty at the rear. Braking is done by drum brakes on both ends while a disc brake isn’t offered even as an option. The Honda Activa also features Combi Brake System (CBS) and tubeless tyres. The scooter rides on 10-inch steel wheels shod with 90/100 section tyres. The Honda Activa has a 5.3-litre fuel tank and weighs 108kg. Performance of the motorcycle is also good with respect to its rivals and it offers decent fuel efficiency as well. It seems that Honda has got it right the third time around. Whenever you are planning to buy a bike, don’t forget to add insurance to it. This is a basic thing that you should have after purchasing a bike. It will protect you from unwanted mishaps. Moreover, as per the Indian law, it is compulsory to have a bike insurance cover, otherwise, you would not be liable to drive your bike on the roads of India.